Last week was a wonderful week in Grade 4. Guess what? It was Book Week! Book Week’s theme this year was “All the Bookshelf’s a Stage”. 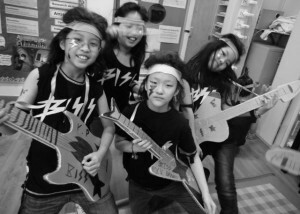 The focus was on performing arts. Our class had the special job of representing music, so we dressed up as rockstars. We sang a song called “All the World is a Stage” by a rockband from the 1970s called Slade. 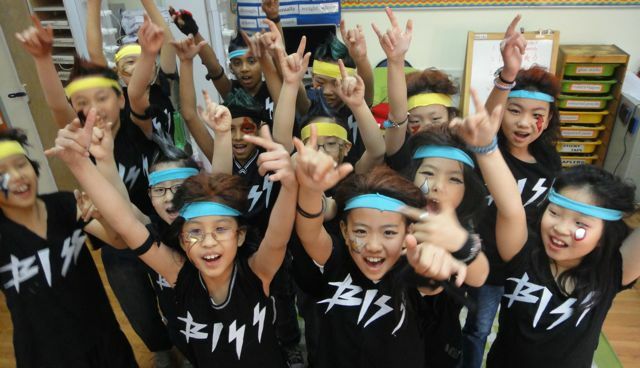 For our costumes we wore black t-shirts with BISS written on them in cool fonts. We also spiked our hair using gel. Then we sprayed our hair any color we wanted! We even drew cool symbols on our face like lighting bolts. It was really fun and we looked so cool. During Book Week we also had the Living Library, in which people came to tell us about their lives and jobs. Grade 4 really listened to what each person said and we asked good questions. At the Living Library there was a computer game engineer, a bronze medalist in synchronized swimming, a UN aid worker and many other interesting people. 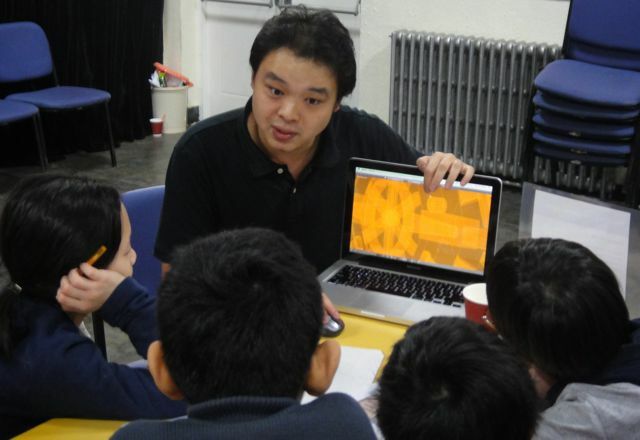 A published illustrator also came to vist us during the week. Her name was Anne Spudvillas and she told us all about the books she has illustrated. Her most famous book is the children’s version of “Mao’s Last Dancer”. She taught us how to draw using charcoal and we drew giant cats. During Book Week we exhibited our recycled book art. 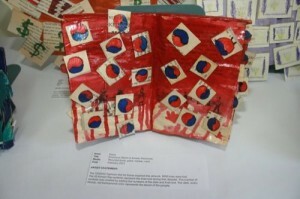 In art class, Grade 4 made disaster memorial books as part of our inquiry into natural forces. For this cool project we had to research a famous natural disaster and when, where and how many people died in this disaster. Then we found some symbols representing the disaster and created the number of symbols to match the number of deaths in the disaster. We also painted the book a color to represent the type of disaster (e.g. blue for floods, red for fires) and varnished our books. During SLCs, we showed our artwork to our parents. They were fascinated. It was such a busy and exciting week! Natural Disaster Memorial (made from a recycled book). What was your favorite part of Book Week? Explain what you learned from one of the Living Library guests. 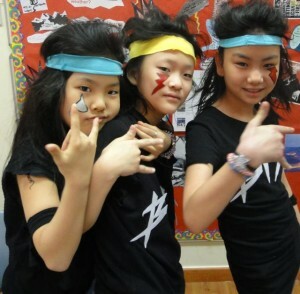 During Book Week, I really enjoyed the head banging during our performance. It felt like I was on the stage all by myself! I forgot that everyone else was there. Also, I enjoyed Grade 5′s ‘Circus’ and I thought it looked kind of ridiculous. I liked how they painted their face with white, red and black. There were giraffes, acrobats, and clowns dancing like they were in the real circus. I look forward finding out next year’s book week theme! My favorite part of Book Week was when we sang “All the World is a Stage” because I liked it when we did the pose and did it in the rock stlye. During the Living Library, I learned that Mrs Mei Li’s life is very different from mine. Her hometown uses bamboo to make a fishing nets and when it is New Year they eat rice cakes.